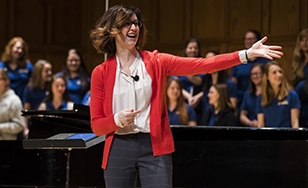 The College hosted Minnesota Public Radio's Bring the Sing choral event on March 24 in the Mitchell Auditorium on campus. Despite adverse weather, singers from throughout the Northland gathered, enthusiastically joining St. Scholastica choir members for a program that was part choral workshop, part recording session. Dr. Bret Amundson, director of Choral Activities, and Dr. Sarah Ludwig, assistant director of Choral Activities, led the event. After the morning workshop, MPR recorded the afternoon performance. Photos and audio are posted on the MPR website. The singers performed four works: a movement from Vivaldi's "Gloria in D," Mark Miller's "Draw the Circle Wide," the traditional South African song "Ukuthula" ("Peace"), and André Thomas' "Beautiful City." This was the third year Bring the Sing has been hosted by St. Scholastica, the institutional sponsor of MPR in Duluth. "The goal is to bring communities together to sing," Amundson said. "This is for people of all abilities and skills who love to sing but don't necessarily have the opportunity to sing in a group."